FX Exploit is an indicator for the Forex market. The indicator applies the algorithm defining strength and activity of currencies. 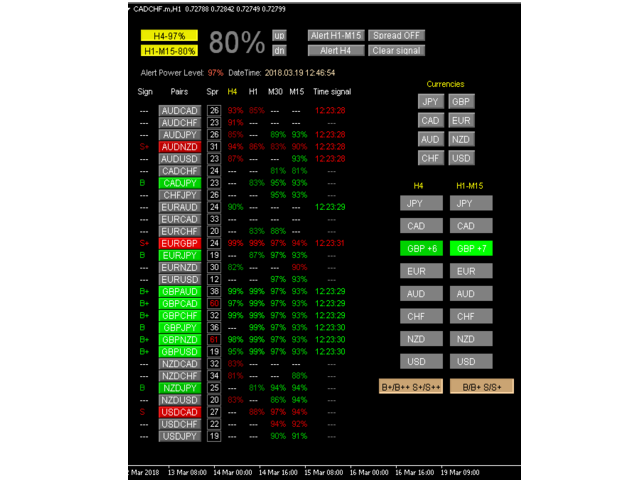 The algorithm is applied for each of the 28 pairs and four timeframes simultaneously. 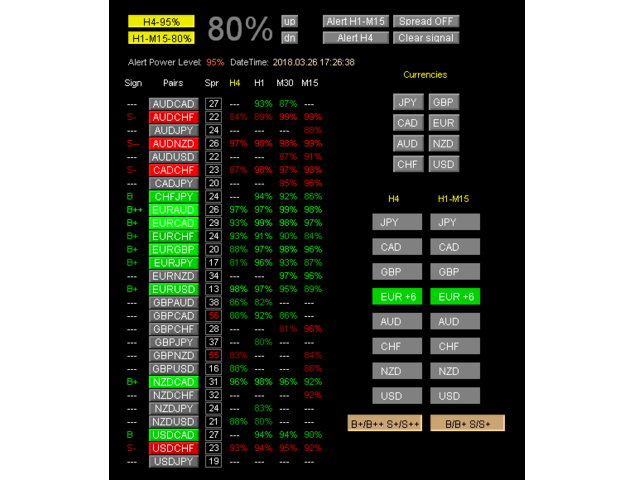 The indicator is displayed as a panel with the ability to conveniently open charts of the currency pairs. The indicator shows activity on four timeframes, while the activity % is displayed in the columns. By default, active pairs have brighter color than less active ones. 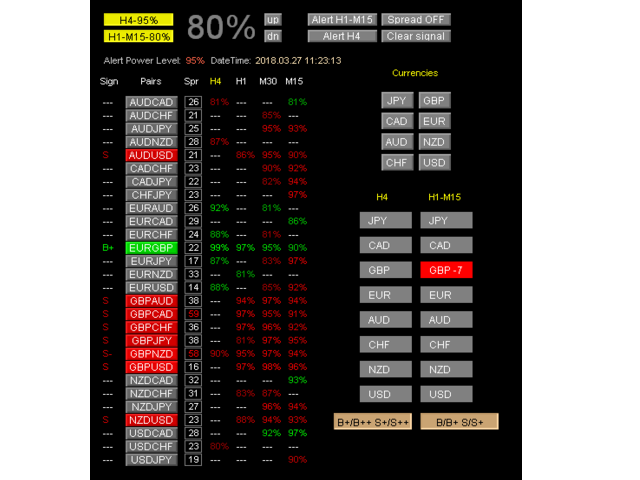 FX Exploit measures strength or activity of each of the 28 currency pairs. In case of multiple active pairs, if the activity exceeds a threshold value (the default is 95%) and remains stable for some time and increases, this is a good moment for a market entry. A trading time is a key factor as well. Opening of European and American sessions is usually the most active time period. The trading panel is designed to open several positions for different instruments (order baskets). Take profit and stop loss levels are not set directly via the panel. You can use EAs tracking order baskets' total profit or loss. Use the trading panel at the opening of a European or American session as well as after economic news. The frequency of signals depends on the market activity. The activity of the market, and therefore the indicator's values are affected by seasonality (in summer, activity of markets is usually low). The indicator is only a tool. It does not predict the future price movement, it follows the price. However, simultaneous analysis of multiple currency pairs can have predictive value. Activity on multiple pairs with a common currency (for example, 7 pairs with CAD, 7 pairs with GBP) is considered a strong signal. Special columns of activity of currency pairs for H4 and H1-M15 show how many currency pairs are active at the moment, and which currency is the strongest or the weakest. +7 is the strongest currency and -7 is the weakest currency. A signal from the Н4 timeframe is considered to be stronger than a signal from the Н1-М15 timeframe. The best results on news trading have been achieved on pairs with GBP, CAD, NZD, AUD, JPY and EUR. News on USD should be traded carefully, as pairs with this currency may have false signals, when the price may reverse after an impulse. You can use any broker, preferably with a small spread. It can be sued on cent accounts. Use 5-digit quotes. You can also try the demo version - FX Exploit. Before using on a real account, try out the indicator features on a demo one. Very helpful dashboard! It's easy to use and gives an overwiev for all 28 pairs. Good tools, if it can provide exit signal, that will be fantastic.Well done to the author. Fx Exploit is a very good dashboard as it is.. but i got it customized (with a few additions) for my style of trading by Aliaksandr who is a very nice and helpful and supportive person.. If you are looking for a Holy Grail or a crystal ball magic indicator/dashboard then you will be disappointed... I do have quite a few years of experience and use it along with my technical analysis and my manual system combined... It does help me pick more profitable trades and reach my personal daily goal (as a scalper/ day trader). Don't be bothered by one person's negative comment in here... i have tried and tested it.. it works for me! And if you have any issues/problems.. just write to Aliaksandr.. he responds promptly. If anybody ask's me about it.. i would 100% recommend it! I have rented for a month. Impossible to use it. Doesnt work for me. The author promise a manual but never received anything. Very bad support. He said me that the problem was with prefix but I don't have prefix. Bad investment. Extremely happy with this indicator. Have been trying for a week. So far results are pretty good. Signals are quite accurate. Though there were not many signals appearing during asian and euro session, however, once signals trigger, if you know how to confirm with price action, this indicator definitely brings profits! Well done to the author. Changed the appearance of the indicator and slightly changed the names of the indicator parameters.